Select “iPod” on the “Select Audio Source” screen. Select “Browse” on the “iPod” screen. Select the desired play mode by selecting the “Playlists”, “Artists”, “Albums”, “Songs”, “Podcasts”, “Audio books”, “Genres”, “Composers” or “Video”. Then select a song to begin using the selected play mode. ●“Made for iPod”, “Made for iPhone” and “Made for iPad” mean that an electronic accessory has been designed to connect specifically to iPod or iPhone, or iPad, respectively, and has been certified by the developer to meet Apple performance standards. ●Apple is not responsible for the operation of this device or its compliance with safety and regulatory standards. Please note that the use of this accessory with iPod, iPhone or iPad may affect wireless performance. ●iPad, iPhone, iPod, iPod classic, iPod nano, and iPod touch are trademarks of Apple Inc., registered in the U.S. and other countries. Lightning is a trademark of Apple Inc.
●Depending on the iPod and songs in the iPod, iPod cover art may be displayed. ●This function can be changed to on/off. (→P. 262) ●It may take time to display iPod cover art, and the iPod may not be operated while the cover art display is in process. ●Only iPod cover art that is saved in JPEG format can be displayed. ●When an iPod is connected and the audio source is changed to iPod mode, the iPod will resume play from the same point in which it was last used. ●Depending on the iPod that is connected to the system, certain functions may not be available. If a function is unavailable due to a malfunction (as opposed to a system specification), disconnecting the device and reconnecting it may resolve the problem. 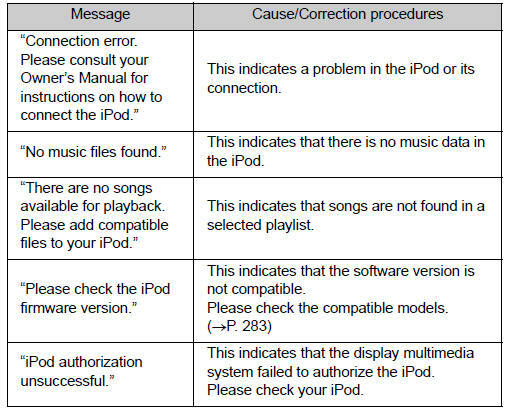 ●While connected to the system, the iPod cannot be operated with its own controls. 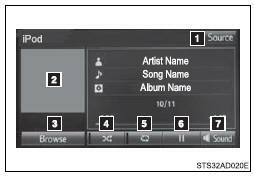 It is necessary to use the controls of the vehicle’s multimedia system instead. ●When the battery level of an iPod is very low, the iPod may not operate. If so, charge the iPod before use. To resolve most problems encountered when using your iPod, disconnect your iPod from the vehicle iPod connection and reset it. For instructions on how to reset your iPod, refer to your iPod Owner’s Manual. ●Do not leave the iPod in the vehicle. The temperature inside the vehicle may become high, resulting in damage to the iPod. ●Do not push down on or apply unnecessary pressure to the iPod while it is connected. ●Do not insert foreign objects into the port.